West Australian Ballet’s enchanting production of The Nutcracker treats audiences to a little magic before they even enter His Majesty’s Theatre. A snowy blizzard falling onto the street outside transforms a mild Perth evening into a wintry wonderland befitting this Christmassy tale. Inside the auditorium, projected snowflakes fall softly onto the white-dusted set of a London street. Choreographed by Jayne Smeulders, Sandy Delasalle and Aurélien Scanella in 2016, this version of The Nutcracker, set to Tchaikovsky’s iconic and beloved score, follows the story of the Stahlbaum’s Christmas Eve party and is filled with child-like wonder and magic. Act I opens with Uncle Drosselmeyer (Liam Green) in his toymaker’s workshop, adding some final adjustments to his most prized dolls. As the much-loved, eccentric uncle, Green impressed in this performance, with broad sweeping arabesques, light confident allegro and a hint of appealing cheek. Wonderfully intricate sets and costumes by design duo Phil R Daniels and Charles Cusick Smith present continual surprises; peep holes open to reveal the whole magical scene, realised by Jon Buswell’s stunning lighting. As the Stahlbaum party unfolds, gathering guests enter a large ball room; the centrepiece, a table laden heavy with presents under a giant festive Christmas tree. Clara and Fritz, the Stahlbaum children, are excited by Drosselmeyer’s arrival. Dancing the role of Clara in this cast, Carina Roberts was delightfully earnest, while Matthew Edwardson charmed as her boisterous and jealous brother Fritz. A highlight of this scene was the polished and exuberant performance given by the eight young guest artists. The company dancers were elegant in dark gowns and suits, sweeping across the stage with ease, but it was Roberts and the children who stole the spotlight. Drosselmeyer enchants the children, weaving magic and giving them wondrous toys, and Clara is entranced by her Nutcracker doll. Much later, unable to sleep, she returns to where she has left the Nutcracker, under the Christmas tree, and the real magic begins. There’s an epic battle between evil pirate rats and her now life-size Nutcracker, accompanied by an army of toy soldiers, assisted by Uncle Drosselmeyer. As the King Rat, Christian Luck was sassy and comical in the clever battle sequence that leaves Clara and her Nutcracker victorious. Matthew Lehmann (Nutcracker Prince) and Claire Voss (Sugar Plum Fairy) in ‘The Nutcracker’. Photo :Sergey Pevnev. Drosselmeyer transforms the Nutcracker into a Prince (Matthew Lehmann) who dances with Clara before journeying together to a Winter Wonderland. Twelve dazzling snowflakes and a Snow Queen (Claire Voss) demonstrated sparkling footwork, precise formations and graceful port de bras in this kaleidoscopic waltz, complete with softly falling snow. The corps de ballet were again strong in Act II, in which Clara, the Prince and Drosselmeyer venture to the Land of Sweets. The Sugar Plum Fairy’s invitation for the special guests to view a suite of performances provides a showcase of dancing feats. Dressed in candy-pink tutus for the well-loved Waltz of the Flowers, the corps wove through creative compositions, demonstrating beautiful technique and style, supported by the glorious music of the West Australian Philharmonic Orchestra under the seamless direction of Myron Romanul. 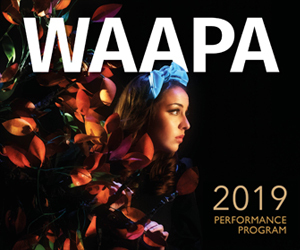 Highlights of Act II included the fiery and stylish Polly Hilton with her three Spanish suitors, Adam Alzaim’s fabulously athletic, crowd-pleasing Russian solo and the trio of sweet, striped Mirlitons (Nikki Blain, Stefano Russiello and Chihiro Nomura). While tradition has its value, I found elements of this scene problematic for a 2018 platform – particularly the cultural misappropriation within the Arabian and Chinese sections, which could be easily avoided with updated choreography. That said, both dances were sensuously and effervescently performed. The Grand Pas de Deux had some thrilling moments and improved in confidence throughout but was a little shaky in the performance viewed. The Sugar Plum Fairy (Claire Voss) showed grace and poise in the main, but her performance felt tense and laboured at times. Her Prince (Lehmann) demonstrated neat turns and skilful, reliable partnering, though his allegro occasionally lacked attack. A lively and colourful finale brings the story to conclusion, but was it all just a dream? This is a timeless and engaging story with beautiful dancing, stunning design, enchanting music and magic galore that will appeal to the young and the young at heart. Read a review of The Nutcracker from junior Seesaw critic Bethany Stopher, age 12. 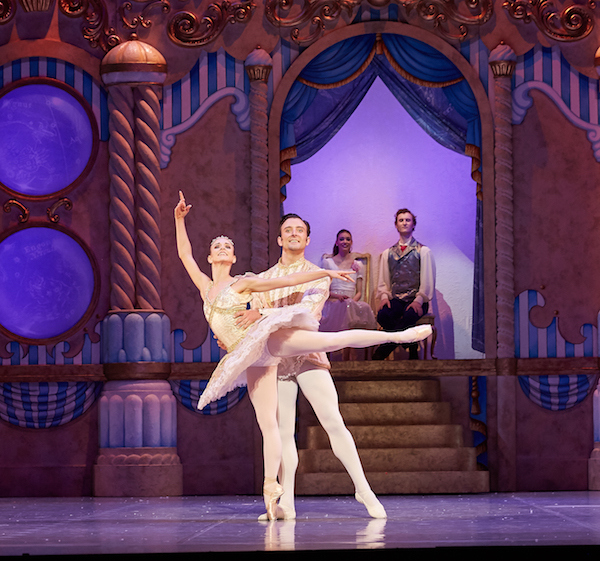 Pictured top: Liam Green and Carina Roberts in The Nutcracker. Photo: Sergey Pevnev.